Note: Each unit reported must be engaged in geospatial education and/or research at your institution or engaged in applying geospatial education or research within one or more application domains. Please list a URL (if any) to a description of Outreach and/or Public Service Activities by the unit. Alternatively, list a few illustrative examples. Do you desire to document in detail another organizational unit in your EOI? Please list additional departments, schools, research centers and similar units engaged in geospatial education or research at your institution. Please provide a statement in how the institution through the named units above will contribute to the objectives of the UN-GGIM Academic Network. Note: For guidance on expectations, please consult the objectives, functions, and other statements in the draft Terms of Reference (TOR) for the UN-GGIM Academic Network. Note: UN-GGIM Academic Network Delegates from the institution should be members of or affiliated with one or more of the above listed academic or research units. It is up to the institution to determine who will be listed as the lead and second delegate. Most voting of the UN-GGIM Academic Network is intended to occur through electronic balloting. Any official voting by the institution occurs through the lead delegate. (i)The official listing of delegates from a member organization may be changed with three days’ prior notice by the office of the chief administrator of the member organization or by the lead delegate from that organization. The email address provided above is the one to which the official one-time-use online ballot for the institution will be sent in the event of voting, such as for officers or admitting new members. (i) The second delegate may act for the lead delegate in casting votes at physical meetings in the event that the lead delegate is not present. (i)Any geospatial specialist affiliated with the institution may be listed as a Correspondence Geospatial Specialist who will be included on mailing lists for general UN-GGIM Academic Network announcements and notices and may attend meetings of the UN-GGIM Academic Network. The following statement must be contained on the letterhead of the institution and signed by the President (or similarly named head) of the Institution in a Letter of Commitment. Alternatively, the letter may be provided and signed by a unit head that has authorization to act for the institution in the matters attested to in the letter. Required Language in the Letter: "If admitted to the UN-GGIM Academic Network, [INSERT NAME OF INSTITUTION] commits to fulfilling the responsibilities of membership in the UN-GGIM Academic Network and our institution explicitly authorizes the UN-GGIM Academic Network to list the name of our institution as a member on its web site and in its literature. Further, information provided though the Expression of Interest Online Form may be posted on the web site of the UN-GGIM Academic Network at its discretion." Please upload the letter here or send a scanned/digital version of the signed and dated letter to Dr. Abbas Rajabifard, Chair, UN-GGIM Academic Network Task Team (abbas.r@unimelb.edu.au). The Expression of Interest is not complete until this letter has been received. Through its delegates or other specialists, each member organization is expected to contribute substantively to the work of at least one UN-GGIM Academic Network committee or initiative each year. 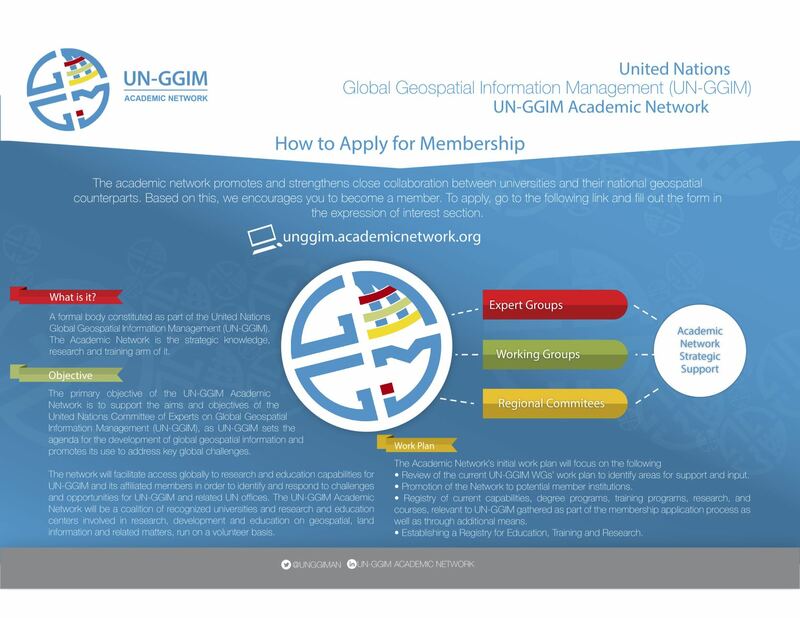 • UN-GGIM Academic Network institutional members are allowed to use the UN-GGIM Academic Network logo on their web sites and in other written materials. • UN-GGIM Academic Network institutional members are banned from using the standard United Nations logo unless they receive explicit written authorized permission to do so. Through the act of submission of this Expression of Interest (EOI) and upon admission to the UN-GGM Academic Network, our institution agress to and commits to fulfilling these obligations.